This little "just because" card started around the dp paper I found in my stash. I did faux stiching around the green background cardstock. 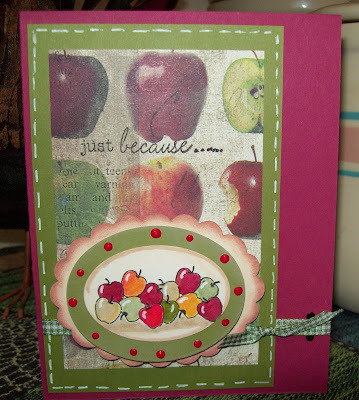 I punched the scallop oval and then stacked the plain ovals on top with the final one holding the image from Stampin Up's Basket Full of Fun stamp set. I colored it with my Copics and added a "shiny" accent with a white gel pen. I hope you enjoy the card. Thank you for stopping by and come back again soon!